Old Green Gage is the definitive "gage", and often considered the best flavoured of any plum variety. It is described by Victorian fruit enthusiast Robert Hogg as "tender, melting, and very juicy, with a rich, sugary and most delicious flavour", whilst H.V. Taylor in 'The Plums of England' (1949) rates it as "For all purposes unsurpassed". Please fill in the details below and we will let you know when Old Green Gage plum trees are back in stock. A yellow gage, makes an interesting contrast to Old Greengage. Probably a seedling of Old Green Gage, excellent flavour and a bit easier to grow. An American green gage, a better choice if conditions are less than ideal for Old Green Gage. 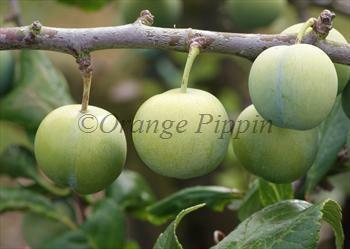 From France, a close relative of Old Greengage, and a bit easier to grow. Old Green Gage is in flowering group 3. Old Green Gage is self-sterile and needs to be pollinated by another tree of a different variety nearby. Since it flowers in the middle of the blossom season it can be pollinated by most other plum trees. 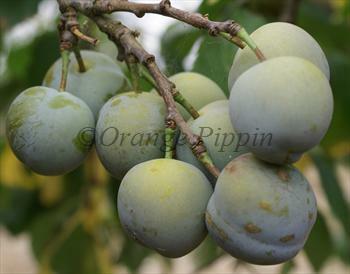 The gages are more fussy in their growing requirements than other plums and Old Greengage is no exception. Taylor in "The Plums of England" mentions the "light and uncertain" crops which is perhaps main horticultural difficulty with Old Green Gage, although in our experience cropping can be good once the tree is established - in any case this is a small price to pay for such excellence of flavour. It is worth remembering that the natural home of most gages is France and Italy - so for more northerly climates such as the UK you need to reproduce the French climate. This is most easily achieved by training the tree as a fan on a south-facing wall, or planting it as a free-standing tree in a sunny sheltered spot in the garden. However although it likes a warm sunny summer, Old Green Gage is surprisingly hardy and will tolerate cold winter weather. Old Greengage is generally considered partially self-fertile but having another pollination partner nearby will definitely help to improve cropping. Old Greengage can be pollinated by most other plum and gage varieties. If the tree sets a lot of fruit after a good spring, be sure to thin the fruitlets, otherwise the plums will be small and have less flavour. Old Green Gage has a fascinating history. The gages are usually included within the European plum species Prunus domestica, but are nevertheless a distinct sub-group, being smaller and more spherical, and usuall green or yellow. They have been cultivated in France since the Middle Ages having been introduced from Italy. In France the many different varieties of green-skinned gages are known collectively as "Reine Claude" after Queen Claude, the wife of Francis I who ruled France from 1515 to 1547. Old Green Gage is believed to be the same variety as the French Grosse Reine Claude. It is generally thought that Old Green Gage was introduced to the UK from France in the 18th century by Sir William Gage, who lived at Bury St. Edmunds and obtained a tree from his brother who was a priest living in Paris. As a result of his promotion of this new variety all green plums tend to be known as "Gages" in the UK. However, whilst Sir William is undoubtedly responsible for the English name, and the Old Green Gage in particular, there is some evidence that his was in fact a re-introduction of a variety already widely grown in England known as Verdoch, which may have come to England from Italy in the Middle Ages. Green-skinned gages were subsequently introduced to the USA in the late 18th century where they are also generally known as Green Gages.